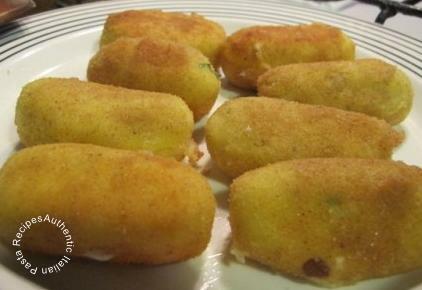 Potato croquettes are a typical Neapolitan recipe, these are small cylinders made of potatoes and eggs filled with stringy mozzarella. Croquettes are breaded in egg and breadcrumbs and then fried. Also famous "zeppole" (fritters made with water, flour and yeast) is a nice fried-food, then some rice-balls named in Italian "arancini" (small round croquettes made with rice), finally a sort of pancakes made with dough and white sauce, very easy and simple. Selecting the best potatoes is crucial to the success of croquettes, choose potatoes from those that are very yellow because they are more "mealy". I made a feast last night at my home with this recipe, so enjoy! Wash the potatoes and cook in a pot with water for 20-30 minutes after boiling. Meanwhile drain the mozzarella, cut into cubes and refrigerate. 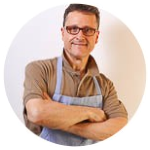 Drain the potatoes, peel and pass them through a food mill or ricer collecting the puree into a large bowl. Add to the mashed potatoes, eggs, Parmesan, pecorino cheese, a pinch of salt, pepper and chopped parsley. Mix all ingredients and mix well to form a firm dough. Moisten your hands, take a spoonful of dough and place in the middle a little mozzarella. Close the dough forming rods that you are then going to place on a serving platter. Pass the potato croquettes in the egg's white and finally in the bread crumbs, then put them in the fridge for an hour. Heat oil in a large frying pan and fry them until the breading is pretty golden. Lift the croquettes with a slotted spoon and place them on a plate lined with paper towels.